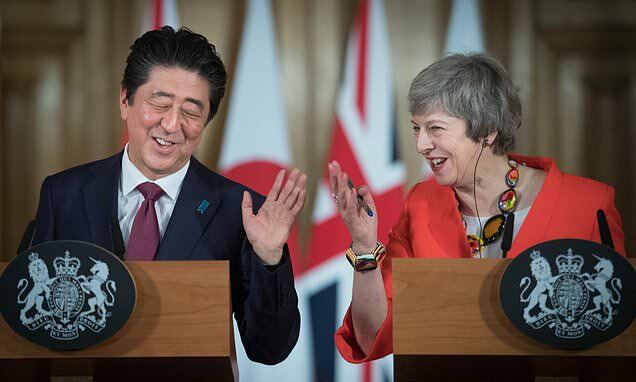 Brexiteers condemned the 'stunt' endorsement of Theresa May's Brexit deal by Shinzo Abe tonight after Japan's PM said the 'whole world' was against no deal. Eurosceptic Tories warned the intervention would fall flat just as Barack Obama's backing for Remain ahead of the 2016 referendum did. Mr Abe weighed into the Brexit debate at a Downing Street press conference with Mrs May - warning the 'world is watching' and pleading with MPs to back her deal in a showdown vote on Tuesday night. He said Japan uses Britain as a 'gateway' to the EU and warned of the impact on jobs and firms of a no deal Brexit. In a rare boost for Mrs May, the Japanese PM hailed the progress Britain has made in securing a Brexit deal and gave his 'total support' to her deal. He told a press conference in No10 today that the 'world is watching' as Britain exits from the European Union. He said: 'For Japan, the UK is the gateway to the European market, Japanese businesses have created 1,000 bases in the UK offering more than 150,000 jobs. 'It is the strong will of Japan to further develop this strong partnership with the UK, to invest more into your country and to enjoy further economic growth with the UK. Mr Abe - one of the PM's closest political allies - hailed Mrs May's hard work in securing a plan. He said: 'I would like to extend my deepest respect for the strong will and hard work by Theresa for the parliamentary approval of the Withdrawal Agreement.